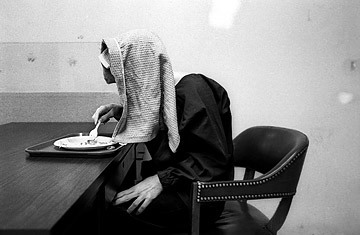 A participant eats during a day program for autistic adults. What exactly is going awry in the brains of people who have autism? The answer is very slowly coming into focus. A paper published in the current issue of Science by researchers at Children's Hospital Boston and members of the Boston-based Autism Consortium identifies five new autism-related gene defects. Already, more than a dozen genetic defects have been found to be associated with autism spectrum disorders, which affect about 1 in 150 children, according to the Centers for Disease Control and Prevention. But the good news, say the Boston researchers, is that many of the genes are beginning to fit into a pattern. "While it might seem discouraging that it's a growing list of genes, we can be encouraged that a common pathway is emerging," says Dr. Christopher Walsh, chief of genetics at Children's Hospital Boston and an author of the paper. Researchers looked at autism-related genes found in large families in the Middle East and Turkey. Big families in which cousins sometimes marry cousins are ideal for studying recessive genes. Though the newly identified genes are located in far-flung regions on the 23 human chromosomes, they are related in function: most play a role in learning. These genes are active in creating, reinforcing or modifying synaptic pathways in the brain  physical and biochemical changes that occur when we learn something new. The implication of this work is that autism may fundamentally amount to molecular defects in learning. Symptoms of autism typically emerge during the first five years of life  a period when a child normally picks up language, social skills and many other new abilities. Scientists call this kind of growth "experience-dependent learning," and researchers know that it is associated with enormous changes in brain circuitry. At least 300 genes switch on and off to regulate experience-dependent learning. Defects in any number of them could conceivably result in some symptoms of autism. There may be hundreds of varieties of autism. From what researchers have seen so far, says Walsh, "It looks like almost every child with autism is different from the next  where discoveries have been made, a different gene is mutated in almost every child." Autism, like most mental disorders, is largely defined by external behaviors rather than a clear biological understanding. Genetic studies like this one, observes Morrow, "offer a fantastic opportunity to define the pathology." To begin to give an explanation to families, he says, "is a big deal." In a statement about the vast range of potential genetic causes of autism, the original version of this story quoted Dr. Eric Morrow of Massachusetts General Hospital as saying, "It looks like almost every child with autism is different from the next  a different gene is mutated in almost every child." Although the original quote was accurately reported, it was incorrectly attributed. The quote was stated by Dr. Christopher Walsh of Children's Hospital Boston. In addition, the researchers note that the statement gives the misleading impression that all children with autism are known to have different genetic defects. In fact, physicians have examined only a small percentage of children who have autism. The quote has been revised to reflect that important distinction.